To almost everyone else in the world, the British probably seem pretty dull when it comes to small talk. The default topic invariably kicks in and we resort to riveting conversation about which road we took to a particular destination... or the weather. This wouldn't be such an issue if we actually had some interesting weather in the UK. We’re noticeably short of hurricanes, snow storms or tropical monsoons. To listen to us, you would think we had an average of one meteorological catastrophe a week. We don’t, but it doesn't take much to shut our airports, delay our trains or ruin the school sports day so better to keep an eye on the weather anyway. Which brings me to apps and a selection of utilities helping to keep track of what’s going on outside the window. Don’t expect a meteorologist’s in-depth review of any of these titles but I’m happy to give my opinion in passing about what they’re like to live with and if the information on screen regularly matches the physical evidence outside. These apps all have one thing in common – form over function. I applaud their approach to user experience it’s just that most rely on a series of gestures to access or input information. This works if you only have one app and no distractions. There are no common actions so you need to relearn to navigate each time. This is a fault across many apps, not just this weather category. A great looking app full of energizing colour and slick animation. It appears a little light on information at the top level but tapping on the centre circle reveals more and swiping from side to side or tilting your phone in either direction achieves the same thing but is more entertaining for a while. It’s called the weather cube because it works just like a cube. You swipe left, right, up or down to reveal more sides. Each surface features weather symbols, temp or other information that quite frankly I can’t keep track of because all sides of the cube are the same colour so you’re never quite sure where you are. This doesn’t really provide at-a-glance reporting but is fun to play with for about 20 seconds. If all I wanted was an app that gave me a brief snapshot of the weather in my current location then I’d be happy to live with this Dieter Rams-style title. Unfortunately, although it looks great (including automatic day and night skins and a sliding hatch to reveal setting controls), there just isn’t enough depth to compete with some of the other apps. This is a new title currently being praised for taking a different approach to weather forecasting. You focus on activities such as dog walking, jogging or arranging a BBQ and then set your ideal weather conditions – temperature, wind speed and time of day, etc. Each activity already starts with some recommended parameters to avoid night-time balloon flights in a hurricane or skiing in a heatwave. When the conditions are matched in your desired location, you get a digital nudge. A nice idea but I’ve really struggled with the gestures for the nav and the location remains uneditable so all my activities have to take place in Farnborough, about 3 miles from my house. There needs to be a round of bug fixes and amends before Foresee gets the thumbs up from me. Information-rich and gimmick-light, these apps take a more conventional approach to weather reporting. They're less entertaining so are they more useful? ...speaking of which, here’s Yahoo’s official weather app. They’ve made a really good job of the visual approach (the app draws in Flickr images as the background to each location) and the visual data representation is excellent – somewhere between Android and iOS7. A subtle parallax effect is employed as you swipe left and right to change the location and a panel slides up from the bottom of the screen to reveal daily and weekly forecast, an expandable location map, rainfall, Wind & pressure and a sunrise/sunset animated visual. The only visual glitch is an odd 1 pixel purple line at the top of the screen. I don’t think it’s a branding attempt. Does exactly what it says on the tin. Big bright graphics relay information in an instant, with clear forecasts by the hour or day. No fancy tricks, just instant weather. This is now my default app. So which app provides the most accurate reading? Well, it’s this one. How do I know? Because the free app comes with its own £139 weather station! Netatmo offers more than a forecast or report on current conditions, it streams continuous data via its smooth aluminium indoor and outdoor modules. These devices connect to a home or office Wi-Fi network then relay all information to the smartphone and tablet apps. As the monitors are physically set up in one place, you don’t have the multiple location options on offer with other apps unless you’re prepared to spend another £159 and place one somewhere else. What you lose in global information, you more than gain in localised data. The weather stations relay temperature, humidity, 5-day forecast, CO2 and dB levels. The last two offer a glimpse of Netatmo’s focus on environmental quality and the app alerts users when levels breach certain parameters, requiring a simple action such as opening a window or making your kids shut up to bring quality back in line. The weather stations also provide (anonymous) global data for meteorologists and environmentalists to give a clearer picture of climate change. 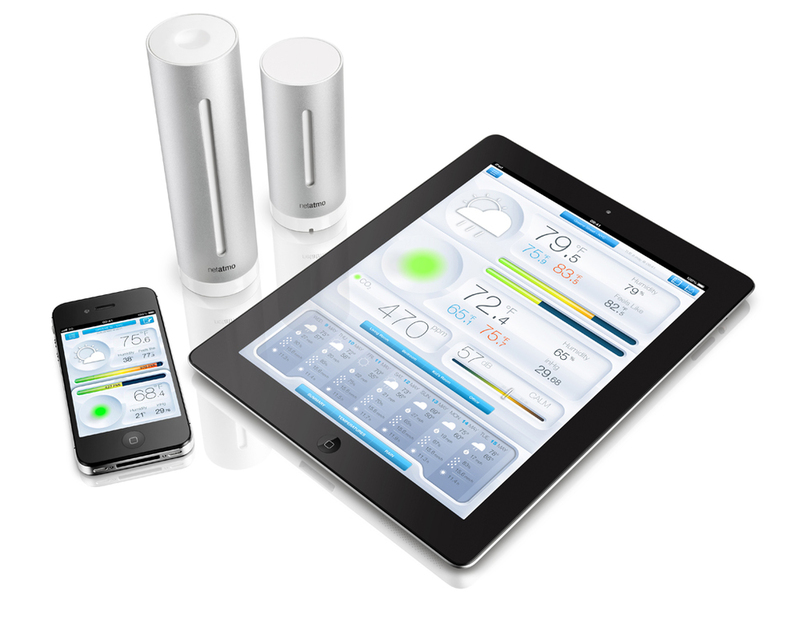 If you want the most accurate atmospheric report in a specific location, Netatmo Weather Station can’t be beaten. It’s not cheap but essential kit for weather nerds, it really does become quite addictive! If you don't want to buy hardware then either the BBC or Yahoo apps (both free) get my vote. The others get marks for trying, but after initially entertaining, they ultimately confuse or disappoint their audience.